Reschedule of the program due to inclement weather is Monday, September 18th at 5:30 pm. 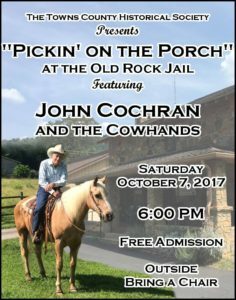 Mike Nichols from Sylva, NC, will be speaking on the old time singing in the mountains at the Towns County Historical Society meeting on September 11, 2017. Shape note singing it was called and he not only will be telling us the history of this type of music, but also will help those in the audience to sing along with him. Come see what shape note singing is all about. It should be a fun meeting. Visitors are welcome and we invite you to join our organization. Come early as we’ve been having capacity crowds. 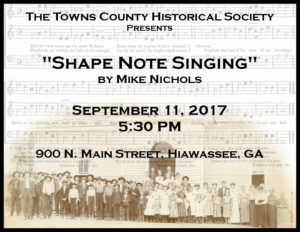 We start at 5:30 p.m. promptly and meet at the historical society located at 900 North Main Street in Hiawassee next to the Anderson Bridge.